Have you ever walked into a room only to realize that you forgot why you went into the room in the first place? Scientists believe that we have forgetful experiences like this because we are action-oriented, not process-oriented. In other words, we focus on what we want to do, not on how we go about doing it. So when we forget why we were going into the room, we need to stop, remember the goal, then the ‘how,’ or the process of getting that goal, comes back to us. Each of us are complex people and this selective forgetfulness can distort the way we experience our lives. Forgetfulness affects so much of what we see and how we live in our community. Places or activities that are familiar, safe, or comfortable for us often do not store in our minds as memories very well. When we have a relaxing movie night at home with popcorn, go for a walk, or enjoy some mindless banter with a friend, our mind may not store those experiences in our brains for easy retrieval at a later time. Our relaxing and ‘down’ times are filtered out and forgotten. The amnesia we experience around the simple pleasures of life can be tragic. The things we want to remember, we forget, and the the things we hope to forget are sometimes seared on our mind. One strong painful memory or encounter in our community might overshadow hundreds of positive and forgotten experiences. We forget the beautiful and peaceful strolls through our neighbourhood, the simple fun we have with our children, or the rest we enjoyed the evening before. Our neighbourhood is the stage upon which we enjoy hope, beauty and goodness, but if we fail to remember the wonderful things we’ve been given, we may overlook the sheer gift we’ve been given. Our neighbourhood is a place where memories are made, if only we stopped to let those memories sink in and shape us. 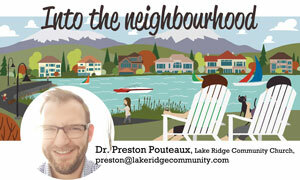 Neighbourhoods are places where people recognize each other. It is a place where we are known and can know others, where we see and are thankful for all that we have, and where our sense of community emerges. If we forget and overlook all of this, we miss out. Andrew Rumsey wrote that, “the only prescription for amnesia is therefore anamnesia” or “hopeful remembrance.” Anamnesia, is the opposite of forgetfulness, it is the active pursuit of remembering who we are, what we love, why we are here, and what we are called to do. This ‘hopeful remembrance’ is an active pursuit. We look back with gratitude and excitement, so that we can look forward and see what is next. May you live with hopeful remembrance as you live into your community. May you not allow a few bad experiences to overshadow hundreds of meaningful moments. When we remember what is good, true, and beautiful in our midst, it will lead us in a new direction, and a hopeful future. What are the good things that you have experienced in your neighbourhood, and how will you make sure that you never forget?